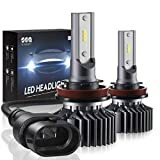 If you find that the old halogen headlamps on your car don’t illuminate the road ahead as well as you wish they would, you should know that you don’t have to buy a $50,000 luxury car to fix the problem. Instead, check out a Sealight S1 Series LED Headlight Bulbs Conversion Kit. These kits are DOT approved and they come in all sizes to fit all cars. They also only take about 15 or 20 minutes to install even if you’re a novice who has never worked on a car before.